I went for lunch at a Chinese restaurant the other day. There’s a big screen showing a tv documentary programme. Unfortunately, I didn’t know the title of the programme. Never mind anyway. It talked about some antioxidant foods, including turmeric powder. According to Wikipedia, “Turmeric is currently being investigated for possible benefits in Alzheimer's disease, cancer, arthritis, and other clinical disorders.” It’s a good news for those who love eating curry too, as turmeric is one of the main species in cooking curry, especially the Indian curry. 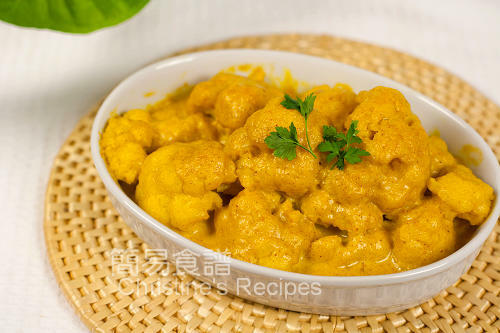 I used turmeric to cook a dish of cauliflower curry, or called Cauliflower in Portuguese sauce. Amazingly, I found my daughter ate a lot of them. I thought it’s the magic of the thick curry sauce. I’m glad to find another way to get my kid eat more greens. Apart from hiding vegetables, I can cook the vegetables in a thick and delicious sauce to intrigue my daughter. Rinse cauliflower and cut into pieces. Blanch in boiling water for 3 minutes. Drain well. Preheat oven to 200C (395F). Heat butter in a wok or sauce pan over medium-low heat. Add turmeric powder and curry powder until fragrant. Pour in vegetable stock (or chicken stock) and bring it to boil. Cook until reduced to 2/3, about 5 minutes. Add coconut milk and thickened cream. Season with salt and sugar. Toss back cauliflower and coat with sauce well. Continue to cook for another 5 minutes. Add thickening and cook to the preferred consistency. Transfer cauliflower together with sauce into an oven-proof baking dish into the preheated oven. Bake for 5 to 8 minutes and let the cauliflower well absorb the sauce and softened. Serve hot. You can use other vegetables if desired, e.g. broccoli. It’s a great way to get my kids to eat more vegetables, including cauliflower or broccoli because they like them in delicious and thick sauce. Before transferring into the preheated oven, it’s better to taste the sauce by yourself, and adjust by adding more salt or sugar to suit your own taste. This reminds me of "Veggies braised with Portuegese sauce- 葡汁蔬菜“．．．．yummy! I love curried cauliflower. This is wonderful with coconut milk. Oh...I want to bookmark this. My family will definitely love this for sure. I love cauliflower and I'm always looking for new recipes for it! What a delicious looking dish! Sounds super delicious! 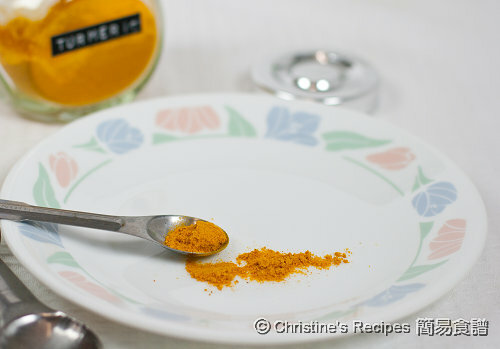 I like the flavors with curry and turmeric powder! Wow...you turned a plain looking cauliflower into something gorgeous! I love it. So golden! You definitely given this cauliflower some life. It's a healthy alternative if you prefer not to have meat on a curry. is 420 gm equal to about a whole head of cauliflower? thanks! If the cauliflower is very large, than it's about half of it. Can the coconut milk and cream be omitted? The coconut milk makes this dish more creamy. You could omit it if you don't like or don't have any. I just made this, it was so yummy! I steamed the cauliflower and then only baked it for a few minutes to let it soak up the sauce. I used creamed coconut because I didn't have any coconut milk. Will make again, hubby loved it too! Glad that you and your hubby loved this dish ! Made this last night and it was fantastic! I LOVED IT! Thanks for your love and shout out !